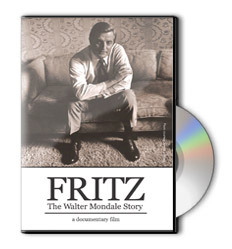 Fritz: The Walter Mondale Story - Trailer from Frozen Feet Films on Vimeo. Directed by award-winning filmmaker Melody Gilbert (Urban Explorers, A Life Without Pain, Whole), FRITZ is narrated by Walter Mondale’s daughter, Eleanor Mondale. This documentary has already been broadcast on five PBS stations and is being used in classrooms and libraries across the country. This film has become part of the Minnesota Historical Society's Mondale Archives. Make a tax-deductible donation to the FRITZ project! all content copyright 2008-2011 frozen feet films. site by boxofbees.